I recently saw someone do a self portrait on here (will insert name tomorrow when I am not so tired) and, since I got bored of tiling different cracks in bricks, I decided to give it a try. 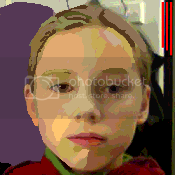 This is my first attempt at a self portrait (I have tried to draw faces in general, although not pixel art), so my anatomy is not the best. I just did this in the last hour or so, at midnight, so the shape, shading, etc. is VERY rudimentary. I am going to continue working on this tomorrow morning, but feel free to edit it as you wish. Although I am looking for comments and criticism on every aspect of the work, here are some things that I have noticed that seem not quite right to me. -Since my dithering is absolute bull stool, I have resorted to just using (too?) many colors. 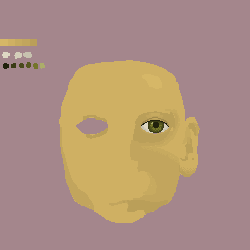 Not sure if it's fine, or if I should try dithering. -My right eye is drifting up and to the right, not that I can't fix this. The only reason I didn't was, being a human being, I must sleep once in a while. Just for clarification, I am male, and I have long hair. In my reference, it is tied back; I will most likely experiment with this in the future. Some things you should consider learning are anatomy and proportion, they will serve you well as you develop. your nose to your chin. They are all the same distance. Some things specific to your face: your ears are not the same shape, your irises are approximately the same size as the bulb of your nose, and like every other human on this planet, your face is asymettrical. A few things to remember: the human face can be divided into 3 equal length parts: from your hairline to your eyebrows, from your eyebrows to the bottom of your nose, and from the bottom of your nose to your chin. They are all the same distance. This is an idealised generalisation, just like the 8 head figure. It is nothing more, nothing less. In most humans it is not true. I took a bunch of images from faceresearch.org and measured away. 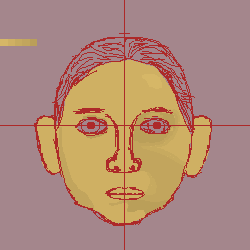 The red lines are the length from hairline to top of eyebrow arch, from there to bottom of nose or start of philtrum in some cases (a bit fudge i guess since you really should go by bone structure, and then to bottom of the bone part of the chin. Of course these are not 100% accurate since it can be a bit tricky esp with the hairline in some cases, but it illustrates that the 3 equal distances idea is just that. Also, lines can be helpful when you start out with drawing. I think it is a good thing to get good linework down (moreso in non-digital media than digital) and measuring using lines to get proportions down as shown in the Bargue plates is helpful as well. Most important is to measure and to make sure that you draw what you are seeing, and not what you think you see. The features you have drawn are very symbolic and not lifelike. This is something to keep in mind. A good book that goes into this in a nice way is "Drawing on the Right Side of the Brain". It is not very expensive and I would suggest it to everyone who is getting into art. Also take into account that people are different and there is no one best way to doing something in most things, esp when it comes to art. Some people prefer to paint from a midtone canvas and work to the lights and darks, and some work on a canvas which is just white and fill out bits as they go. Whatever works for you, but try different approaches before you find something that you like. And even if you found something you like, keep trying things you have not tried before. The variance in length could also be attributed to the fact that all these heads aren't tilted at the exact same angle, though I'm mystified why you would measure from the very top of the eyebrow arc. It's just a good rule of thumb to remember whilst drawing, a guide not a rule. The red lines were just guides, a rough sketch. I changed the face shape a bit (made the jawline and hairline straighter), changed the right ear shape, along with adding some shading to it, and worked on the right eye. Because of time constraints, I am not able to finish the other half at this time, so you must live with it looking like a freaky halloween mask. 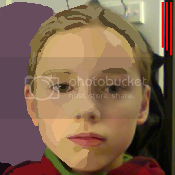 Experimented a bit with dithering on the ear and face shading. Not sure if the dithering should be a nice checkerboard or random (So far, in my other works, I have done random dithering, and it ends up looking horrible). Any insight on this would be great! For the iris, I have made it pretty basic, but I think I might have too many shades. The pupil also seems a bit too small and symmetrical. How I would remedy the symmetry, I don't know. If I try to make it unsymmetrical, it becomes very square or with hard angles. It's a common misstake to hasten yourself into details. Trying out different shading and so is OK, but try to get a whole shape together first and then go into detail. One thing that helped me when learning to draw faces(digital) was simply just to draw onto the picture. When I started doing oil on canvas and wanted to study a special technique I printed a copy of a painting and started to paint over it, mimicing what the artist had done. The same thing can be done here. Simply use the colour from the picture and try to get a shape going. get a much more coherent and lifelike portrait. Your post is so amazing ptoing, thank you very much for this !